Everyone agrees that the developers who illegally demolished the 1850s Corkman / Carlton Inn in Carlton over 18 months ago should be fined to the maximum, and that preferably any development rights they might have had on the site should be severely restricted. But the fines available are not large and are being challenged in various court actions and tribunals right now. We have written to the Minister for Planning requesting new penalties be created that would prevent any more illegal heritage demolition but we have not had a response. See our letter here. Meanwhile, the planning controls for the site have recently been advertised for comment, and unfortunately they are based on what they might have been able to get a permit for if they hadn’t demolished anything, rather than being stronger, because, well, this is most likely to get through the legal objections. This means that they would only have to reconstruct the facades, and then build up to 40m (12 storeys) or more, set back only 6m ! We think that’s simply not good enough. We say that the whole Victorian era parts of the hotel should be reconstructed, and any development on the rear half of the site be restricted to about 5 levels. You have an opportunity to tell the City of Melbourne what you think through their ‘Participate’ process. You can fill out the form here and submit by next Friday, 20th April. 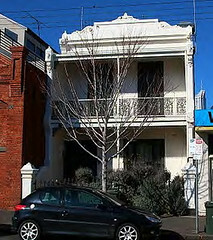 The Carlton Inn was built in 1859, extended to the left in 1888. The remains in October 2016. 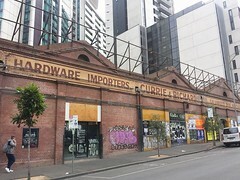 Regarding the historic 1850’s Corkman Carlton Inn, I am appalled that this Amendment would allow the owners, who had deliberately destroyed this historic building to simply reconstruct the facades ‘with as much original material as possible’. They should be required to reconstruct in double brick the entire building they destroyed and then be allowed to build up only 4 or 5 storeys with considerable setback. The developers idea of building a facade and then build up to 40m or more set back only 6m from the facades is ridiculous. They would be being rewarded for their deliberate illegal demolition that has deprived Melbourne of a piece of its early heritage. It is too important a building to be so grossly overshadowed by a huge building so close behind it. Even if the hotel had not been demolished illegally, this would be a terrible outcome for such an important heritage and iconic building. Thanks Fiona, dont forget to send your thoughts to the Minister ! At ICCROM in Rome we were taught that once something’s gone, it’s gone and cannot be recovered except in caricature. This is the SPAB Ruskinian approach, followed in Rome since 1807 at the Colosseum. This lesson was not learnt at the St Kilda Pier Kiosk which was replicated in a form that never existed except on paper. Impose massive fines but do not attempt the charade of a replica. ← Metro Tunnel – Campbell Arcade Under Threat.